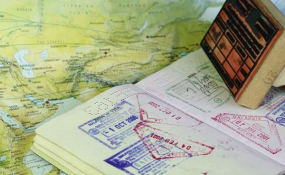 Nairobi — Kenyan business people and academia travelling to South Africa will now be issued with multiple entry visas valid for up to 10 years. Frequent travellers will be eligible for three-year multiple entry visas effective December 1, 2018 under the agreement reached Monday in Pretoria by Kenya's Interior Cabinet Secretary Fred Matiangi and South Africa's Home Affairs Minister Malusi Gigaba. "Technical officers from both countries were also tasked with finding ways of reducing travel restrictions, with a view of completely removing short term (180) days) and transit visa requirements for nationals from the two countries with ordinary passports," a statement from the Interior Ministry indicated. The new deal is also set to benefit government officials who are travelling on official business to South Africa as they will be granted three-month free visas. "With Kenya Airways already doing an average of three non-stop flights from the Jomo Kenyatta International Airport (JKIA) to South Africa daily, the new arrangement is expected to enhance people to people contact and unlock the two countries' tourism and business potential," read part of the statement. According to Matiangi, the deal has further committed both Kenya and South Africa to step up its effort in combating illegal immigration and also protect the integrity of each other's travel documents.